MARCANTONIO, Vito Anthony, a Representative from New York; born in New York City December 10, 1902; attended the grade and high schools; was graduated from the law department of New York University at New York City in 1925; was admitted to the bar in June 1926 and commenced practice in New York City; served as assistant United States district attorney in 1930 and 1931; elected as a Republican to the Seventy-fourth Congress (January 3, 1935-January 3, 1937); unsuccessful candidate for reelection in 1936 to the Seventy-fifth Congress; resumed the practice of law; elected as an American Laborite to the Seventy-sixth and to the five succeeding Congresses (January 3, 1939-January 3, 1951); unsuccessful candidate for reelection in 1950 to the Eighty-second Congress; unsuccessful American-Labor Party candidate for mayor of New York City in 1949; practiced law in Washington, D.C., and later in New York City, until his death in New York City August 9, 1954; interment in Woodlawn Cemetery, New York City (the Bronx), N.Y. Oral History: Includes memoirs concerning New York politics that discuss Marcantonio as well as his own account of his candidacy in the 1949 mayoral election. Oral History: In New York election of 1949: oral history collection, 1949. Described in published guide. Restricted. Papers: 1935-1956. 60 boxes. Includes correspondence, speeches, press releases, and photographs. Detailed inventory of subject files in library. Kaner, Norman J. "Towards A Minority of One: Vito Marcantonio and American Foreign Policy." Ph.D. diss., Rutgers University, 1968. Kling, Merle. "The Tenability of Isolationism and Internationalism as Designations of the Foreign Policy of the United States: A Case Study of Senator Arthur H. Vandenberg and Representative Vito Marcantonio." Ph.D. diss., Washington University, 1949. LaGumina, Salvatore John. "Vito Marcantonio, Labor and the New Deal, 1935-1940." Ph.D. diss., St. John's University, 1966. ___. Vito Marcantonio, The People's Politician. Dubuque, Iowa: Kendall/Hunt Publishing Co., 1969. Lopez, Adalberto. "Vito Marcantonio: An Italian-American's Defense of Puerto Rico and Puerto Ricans." Caribbean Review 8 (January 1979): 16-21. Marcantonio, Vito. "I Vote My Conscience": Debates, Speeches and Writings of Vito Marcantonio. Selected and edited by Annette T. Rubinstein and Associates. New York: The Vito Marcantonio Memorial, 1956. ___. The Registration of Aliens. New York: American Committee for Protection of the Foreign Born, 1940. ___. Vito Marcantonio: Debates, Speeches, and Writings, 1935-1950. Selected and edited by Annette T. Rubinstein and Associates. With a new foreward by Francesco Cordasco. 1956. Reprint, Clifton, N.J.: A. M. Kelley, 1973. Meyer, Gerald. Vito Marcantonio: Radical Politician, 1902-1954. Albany: State University of New York Press, 1989. Ojeda Reyes, Félix. Vito Marcantonio y Puerto Rico: Por Los Trabajadores Y Por La Nacíon. Seleccíon y Estudio Preliminar por Félix Ojeda Reyes. Rio Piedras, P. R.: Ediciones Huracán, 1978. 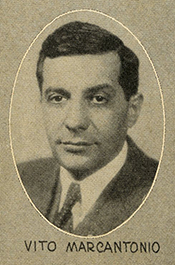 Schaffer, Alan L. Vito Marcantonio, Radical in Congress. Syracuse, N.Y.: Syracuse University Press, 1966.